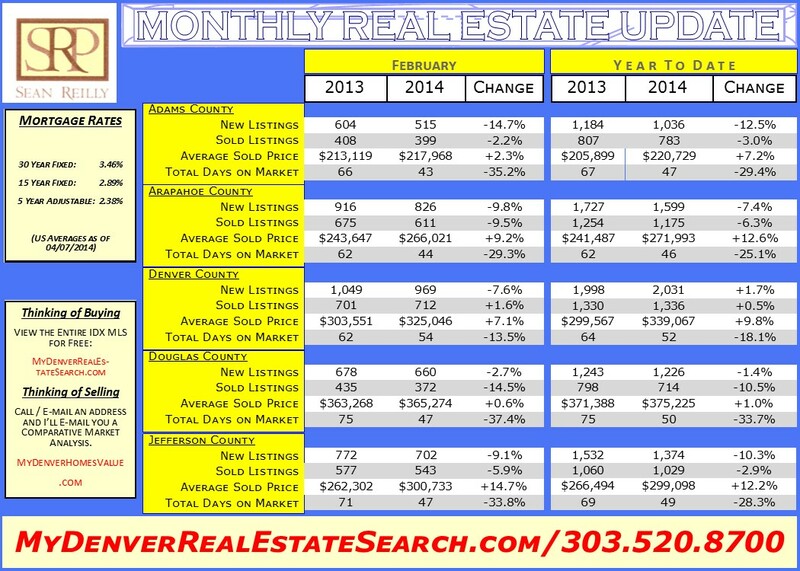 Here is my latest update to the Denver Metro Area Monthly Real Estate Update. Keep in mind that the data is delayed, so February is being updated in April. Here is my YouTube video, or read my analysis below. Click the box in the lower right hand corner of the YouTube video to enlarge your view. Please refer to my Monthly Real Estate Update below to follow my numbers. This update brings us through the end of February 2014. 1. Prices - We now have 2 months of data to look at and, so far, we have not skipped a beat from 2013. Prices are up across all counties with Arapahoe County leading the way with a gain of +12.6%. The laggard at the moment is Douglas County with a +1.0% gain. All other counties are up between 7.2% - 12.6%. This is a good start for the year, but as I have cautioned before, I really don't want the market to get too far in front of us - we saw what happened in 2006-2007. I'd like prices to stabilize and increase in a solid, sustainable manner. Too fast, too quick and we will end up with the media talking about bubbles again. I'll address inventory below in more detail, but the inventory right now is setting us up for more price increases in the near future. Thus far, in 2014, Denver County is the only county that has seen more listings hit the market versus 2013. High competition versus low inventory sets the stage for prices to increase. We'll see how this plays out in the months to come. 2. Sold Listings - Denver County is the only county thus far in 2014 to have a positive gain in sold listings - up +.5%. Just barely up. The remainder of the counties are experiencing between 2.9% - 10.5% losses in listings sold in 2014 versus 2013. I'll discuss this a little more in the inventory section of this update, but time will tell. Is this a temporary glitch that will be made up as we approach the spring / summer season, or will this be a more solid trend? Or, was the first couple of months in 2013 just that good. Keep in mind that we have had some solid pricing gains over the last year, so even while these numbers are down, they are still relatively decent compared to 2013. 3. Days on Market - Numbers here are relatively decent hovering between a low of 47 days (Adams County) to a high of 52 days (Denver County). These numbers have ticked a little higher from the last quarter of 2013, but they are still strong. When the market is strong, sellers tend to test the market by tacking on 5, 10 or more thousand to their asking price. While it's a great market, if a home is overpriced, it just will not sell. This is not always the case, but if you push the market too much, your home will sit. A month and a half still beats the nearly 3 months that it took a mere 18 months ago. 4. Inventory! Inventory! Inventory! - In 2013, people got that real estate was selling and a lot of people jumped in the market. In 2014, people are still aware that the real estate market is hot, but not as many people have jumped in the market as of yet. The year is still young and if we continue w/ price increases and if homes start selling quicker, I believe this number will catch up to 2013, if not surpass it. The only county with a small gain in inventory this year is Denver County which is up 1.5% (also, the only county with a small positive gain in Sold Listings). Douglas County is not too far off keeping pace with 2013 as the county is only down 1.4% compared to last year. Adams County is lagging the group with 12.5% less listings hitting the market thus far. Even though sold listings are down this year, buyers are still in the market. The category that stands to reap the biggest benefit from low inventory is pricing. As we learned in economics class, when there is more demand than supply, prices tend to go up. Thanks. Feel free to shoot me an e-mail with any comments, or you can always call @ 303.520.8700.